I was in the army reserves from 1991- 1999 just basic and ait.i was stationed in Memphis tn and went into irr shortly after I return home from training.i was never called up but received an honorable discharge in 1999. Can I go to the va in Memphis since I have no healthcare? Thank you for your comment. VA health care is on a case by case basis. You will need to contact the VA or use their online eligibility tool to determine if you are eligible for VA health care or not. The VA has new ID cards, which are available to all honorably discharged veterans. You can learn more here. I’m a former Marine reservist .I was injured in a vehicle accident caused by a civilian.Members of my unit were in transit back to our unit when the accident happned. We were in military vehicles and in uniform. The accident happened 89′. Could I possibly be eligible for any medical benefits. Hello James, Thank you for contacting me. Yes, it may be possible, but you would need documentation of some sort to prove the accident happened while you were on duty, or in Drill status. This might include a Line of Duty report or sworn statements from those who were with you when the accident occurred. Then you would need to prove the accident caused health conditions that have negatively impacted your quality of life. I recommend working with a Veterans Service Organization on your claim (DAV, AMVETS, VFW< American Legion, etc.). They have trained benefits counselors that offer free claims assistance and should be able to help you understand exactly which forms are needed and how to apply. I wish you the best of health, and thank you for your service! Really Ryan, a great eligibility piece. My civilian Driving license was cancel by my mental-Health doctor for failing to remember points of an orally read article about some nonsense that made no sense whatsoever? My Care-giver was also in attendance with me. However, she also could not remember or make any sense either which By the standard Would have made her in the same position as I! Seems like we are both incompetent too be on any public highways ? In interjecting, we have no violations of laws and/or points of any kind. I held a professional trucking license as-well ? Please note that we’re in a position of even more reliance on others? Are you able to make any sense out of this? What can I do to help my self ? Hello Paul, I recommend working closely with a veterans advocate or Veterans Service Officer to help you appeal this decision. I would try contacting the VFW, AMVETS, DAV, American Legion, or a similar organization to see if they can put you in touch with someone who can offer personalized assistance. I wish you the best, and thank you for your service! Let’s see… hubby drafted and left Oct 14 1969 and discharged Oct 13 1969. He was gone the entire time…. being discharged on that date cost him one year of points when he went back into the Guards. Many do not realize this was done. . He was drafted into the Marines. He has been denied VA health 3 times….. income each time, fact he stayed stateside, boot camp wasn’t at Lejune. ( wTer issue)… he did break his foot in boot camp, but has a 0 percent disability from that. He was basically told to lie and start complaining about it. He won’t do that. Yes, he gets a pension and social security. But he was basically conscripted, to spend 2 years away from home by his government and they gratefully say thank you with a hearing test. All veterans who were drafted.. ie mandated to leave their homes should automatically be granted services no matter where they served, income, whatever. if he has a 0 percent rating then he is rated by VA and can receive health care. only free coverage is for things you are rated on though. also could you lend me the secret of time travel? how was he discharged the day before he was drafted. With respect, Mr. Palermo. Take your valid state ID and your SS card to a VA Medical Center and, (after September 7, 1980) if you served over two years Honorably or Under Honorable Conditions, you are eligible for benefits. Given also I don’t understand that the only reason a person would not go through eligibility is because you said you were, “…told I make too much money and would most likely be denied…” So you never went through Eligibility? Wrong answer, bro. And does that “Confirm you are NOT a spammer” real or what. Just kidding, nice site. Hello Lanny, The VA assigns each veteran to a Priority Group which determines which care they are eligible to receive. The veteran’s Priority Group may change if for various factors, one of which could be income. You would need to contact the VA for your Priority Group and a list of benefits you are eligible to receive in that Group. I received a claim approval from my civilian job insurance. The claim was made by the DVA Mid-Atlantic CPAC. I looked at the dates and realized it was for routine labs at the VA Clinic. Why are they pulling from my civilian job insurance for labs that I’ve always gotten through the VA? Hello Raeshell, This is something you will need to ask the VA. I don’t have access to individual records, or the ability to delve into their policy as it applies to individual veterans (each situation may be unique, so the only way to get this information is through the VA). I wish you the best, and thank you for your service! I want to file for chronic pain for a SC spinal problem that has gotten considerably worse. I am already TDIU (80%) and also permanent and total. should I file for another exam? and how do I get help for daily tasks that are now becoming very difficult for me? Frankie, I cannot comment on specific medical questions. So I recommend contacting a veterans service rep at an organization such as the DAV, AMVETS, etc. They have trained counselors that may be able to assist you. I wish you the best of health, and thank you for your service! I’m an Air Force veteran (1984 – 1987, honorable discharge) getting ready to retire. I know that my income is above current caps for eligibility and will likely remain so after I retire. What I’m not clear on is whether I can make use of VA Health Services even if there is some cost to me (co-pay, etc.). It seems like I could get care by paying a co-pay, but when talking to a VA representative, she seemed to indicate otherwise (i.e. that I wouldn’t be eligible for care at all). So I guess the basic question is: If my income is above the current eligibility limit for free care, can I still make use of VA services/facilities by paying for them? Hi Mark, I believe the VA representative is correct. My understanding is that if your income is too high to qualify for VA care, then you are ineligible for VA care, even if you would be willing to pay a co-pay. Some veterans may otherwise qualify for health care based on when and where they served, whether or not they have any service-connected disability ratings, or other factors. I encourage all veterans to use the eligibility tool on the VA website, or contact the VA for a veterans benefits overview. The VA makes the final determination. I wish you the best, and thank you for your service! You say to Mr. Palermo are you a spammer, when he asks about income “… told I make too much money and would most likely be denied…” just looking for straight answers. Not trying to be antagonistic. I will apply for benefits but just don’t want to waste my time. An answer to some simple questions makes it easier. 4 years active, 2 years inactive honorable discharge, early 80’s, didn’t spend time in a war zone. No injuries other than a broke wrist while active. Just wanted to post a quick thank you for sharing this article. I hadn’t used my VA medical benefits, as yet, so I was equally surprised at how little I knew about the apparent changes. I have used the VA for many years and carry the Medical card. I served from 1971 until 1980 (Vietnam era veteran, but no combat time), honorable discharge. I was on vacation in Florida and went to the VA hospital in Tampa for something minor and they wanted me to do a financial statement before treatment. I left and went to a 24 hour Med Clinic instead. I don’t carry important papers with me on vacation. I use a regional VA clinic close to home for general check-ups and go to the San Antonio VA hospital for any major tests or treatment. I thought President Trump signed into law a bill saying that veterans going to VA hospital can also go to other hospitals or clinics other than the VA. I currently have a 30 percent service connected disability rating. I’m hoping to retire early. Can I use the VA for all my healthcare needs? Tim, You will be eligible for health care through the VA. But it’s difficult to say the exact level of care you will have access to. Health care access will depend on your Priority Group and availability at your local VA health care facility. I recommend contacting the VA to verify which health care you will have access to. This is the only accurate way to be certain. Why are veterans living in the Philippines not provided proper healthcare except for service connected disabilities. They go to foreign countries to fight or die in them but can not be treated in them. Even medicare is not covered. If i am 100% and dont have part b can i go to non va hospital for any reason? Hello Gary, VA benefits vary by individual and sometimes based on the specific care being provided. 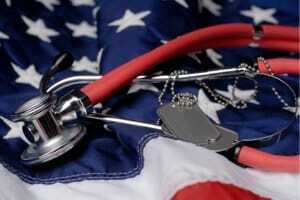 For example, the VA may cover expenses for certain care at other medical centers if they do not offer that coverage. I recommend contacting the VA for a full rundown of your benefits. I wish you the best, and thank you for your service! Do I have to retire from military in order to be seen at the VA hospital. I do receive compensation for service connected VA disabilities. Hello Byron, You should be able to use the VA hospital for some medical care if you have a service-connected disability rating. I encourage you to contact them to ask about your Priority Rating, which services are available to you, and what the costs may be, if any. I am curious if I would qualify for VA medical. I turn 65 in May 2019. Served state side in the USAF from 1972 to 1979. Enlisted 6 years and extended for 1 year. Currently only income is social security. I go on medicare starting in may. I don’t know what is better, VA medical or Medicare. My income is just enough to pay for a roof over my head and food for my wife and me and not much more than that. If I ever get cancer or need a transplanted organ, I could not pay for that even with medicare. So I wonder if VA would be a possible alternative. Please note, I have not been diagnosed with anything other than type 2 diabetes. The best thing to do is to contact the VA. They will be able to help you understand your benefits, including whether or not you will be eligible for health care, and if so, what the copays or other associated costs are. I served and retired honorably in 1980 US Navy. During active duty I contracted graves disease. Had two rounds of radioactive cocktail for total thyroid kill. I get a disability check. I now live in Canada. I need a colonoscopy and the wait times are long. Can I get a colonoscopy in my home town? Hello Glenn, I recommend contacting the VA if you are in their medical system. Alternatively, you can see if you are eligible for TRICARE as a retired military member. Either of these organizations should be able to help you understand your benefits.